I'm so pleased that I decided to try 'Elka' and plan to order more this autumn. Are you enjoying any new to you bulbs this spring? 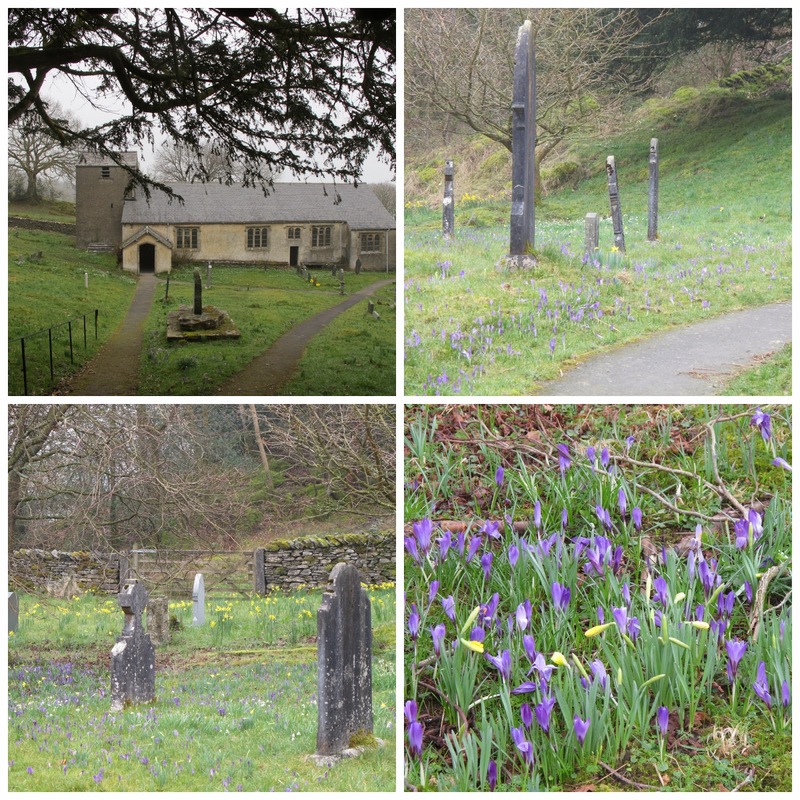 Wordless Wednesday ~ 26th March 2014. Plaque to commemorate the 500th anniversary of St.Anthony's Church, Cartmel Fell, Cumbria 1504 -2004. Prompted by Janet over at Plantaliscous, I'm returning earlier than intended with an update on the great marker pen experiment. I had intended to report back after an interval of six months but here we are just after an interval of four months. Well all five labels have overwintered in a huddle next to each other in the same pot. They have certainly seen some rain. It would be interesting to be able to gauge just how much but there's been more than six months worth in a four month period and then some more! I will have to do some research to see if I can get an accurate picture. I took them out of the control pot yesterday afternoon - I'm even getting into the scientific lingo now. As you can see the pens that have not fared particularly well are the Sharpie fine point permanent marker and the Pilot Super Colour Marker Ultra Fine. The stars to date are the Artline 444XF Paint Marker and the Edding 140s ohp marker. The latter came up as the best and most permanent labelling pen in a one year trial conducted by 'Which? - Gardening' magazine. As mentioned in my post in November the Pilot pen had been my preferred implement for labelling plants for many a year. I will now be contacting Pilot to enquire whether there have been any changes in its manufacture. Thanks for all your comments on the original post. I had planned to add a couple more pens to the experiment which were mentioned by you but could not find them locally. I will have to seek them out and conduct a separate experiment or maybe even start afresh! Whatever there will be more on this subject later this year. These rather striking alien creatures stopped me in my tracks last week or rather caused himself to bring the car to an abrupt halt, so that I could leap out and take a few photos. There were a few clumps of them growing alongside the road up in the Cumbrian fells. I've done some research and have some thoughts on what they might be but thought that it would be fun to share the photos first. Hopefully somebody will confirm my thoughts on identification or prompt me to reach for the books and explore Google again. Whatisit - update. Thanks for all your suggestions. Petasites japonicus or butterbur was the most popular. My guesses at identification initially followed the same line of thought. I got off to a head start by accident when catching up with the February edition of 'The Garden', which included an excellent article on 'Scents of the season'. Petasites fragrans was featured as one of the plants which provides scent in winter. The flower looked very similar so from there I looked into the genus further. However I could not reconcile the leaves on the plants I saw with petasites japonicus, the leaves of which looked much bigger, more rounded and a different colour. Even allowing for changes as the plant matures I was not convinced. I've come to the same conclusion as Wellywoman that it is petasites albus or white butterbur. This is a native of mountainous parts of Europe and south west Asia and was introduced to the UK in the late 1600s. It is more commonly found in the north of the UK where grows in woodlands, beside streams and by the side of roads. Google also kindly confirmed that this plant has been sighted near Cartmel which is where we came across it. I most annoyed with myself though for not bending down to detect if there was any scent from these flowers. Will have to persuade himself to return next year. Some blooms from another 'garden' this month. We are just back from a few days in the Lake District where we went in search of daffodils. We were perhaps a week or so too early to see them at their peak but here you can glimpse some in the beautiful and oh so tranquil setting of St. Anthony's Church on Cartmel Fell. The snowdrops were still just hanging on, there were vivid patches of crocuses, a few primroses in flower and a myriad of daffodils waiting to open in the churchyard. All this beauty in the middle of nowhere! Thanks to Carol from May Dreams Gardens who came up with the brilliant idea of sharing our blooms each month. This year I'm joining in with Lucy's 'Tree Following' meme. I'm ashamed to admit that I really don't know much about trees and am unable to identify most of them once they loose their foliage. So this year I'm hoping to get to know one tree more intimately. The tree in question is a willow. It sits just outside our garden with its toes dipping in water as do many willows. One of our garden boundaries is a small stream and the willow is just on the far side of the stream. At the moment its trunk is nestled in ivy, brambles, nettles and ferns. I'm not sure of what sort of willow it is so will have to do some research, although I do know that it's definitely not a weeping willow. As for wildlife I think that I probably scare off any larger visiting creatures when I'm nearby, although I did see a blackbird flying out of the willow yesterday as well as a grey squirrel who was tenaciously clinging upside down to the main trunk. The tree was here when we moved to our present house when it was much bigger than it is now. Himself tells me it was about seventy feet high until it suffered some serious damage from a gale in early January 2012, which I described here. A tree surgeon came to inspect the damage subsequently performing major surgery. I was most upset at the time as I could not envisage it growing again but sure enough later that spring green shoots sprouted. In one respect the willow is much improved. 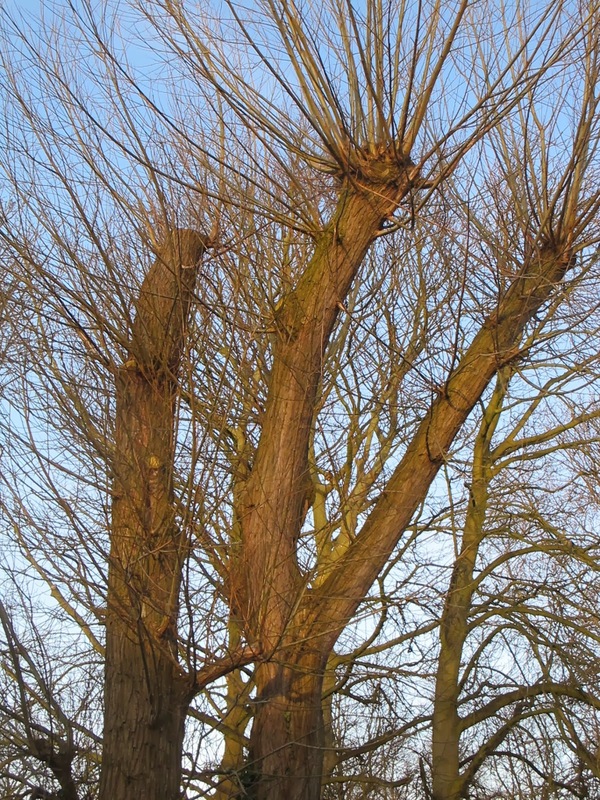 Although I did love listening to it creak on windy nights the overhanging branches were rather too near our house for comfort, so it is now an easier tree to live with. So that is a brief introduction to my tree which I'm looking forward to getting to know better this coming year. Thanks to Lucy over at Loose And Leafy for coming up with such a brilliant idea. Well it looks as if the above could well be the last of my special snowdrops to flower this winter. These flowers though belong to what I think may is galanthus nivalis 'Greenish' but some study of my snowdrop books is in order to confirm its identity. Although it did not throw up one single flower last year I've been rewarded with three this winter. The label in the pot says 'Greenish?' I know that I bought 'Greenish' at some point but the snowdrop bible advises that this plant has almost prostrate leaves, a characteristic that my bulb does not display hence a question mark over its identity. Anyway whatever it is it's a most pleasing to the eye end to the snowdrop season. There is another pot of the double 'Richard Ayres' which has flower buds but sadly they seen to be shrivelling up rather than opening. I've thoroughly enjoyed my snowdrops this winter especially as I was unexpectedly away from home for a good part of last February and March. The season this year seems to have been shorter though. There have been some disappointments especially with some new bulbs which arrived in the green last year. As I away when they arrived himself had to plant them which he nobly did. However out of half a dozen or so new arrivals only one flowered. I'm not sure whether he followed my instructions to the letter or whether the bulbs were not the best quality. However there has been signs of life in all the pots so it's a case of waiting patiently for another twelve months. Time now to try to update my records of what has flowered this year and then to hopefully make a start on what I plan as a permanent snowdrop page on this blog. I've also got some serious work to do during the summer when I intend to repot all the bulbs that were planted in pots before the end of 2013. The plan is to get this done in July or August when the bulbs are still dormant. I'm hoping to unearth spares of some to plant out in the garden so that I can enjoy the best of two worlds - snowdrops in the garden and snowdrops under cover! "Belle De Fontenay - a second early salad potato producing kidney shaped, quite small, waxy potatoes that are hard to beat for salads. It improves with storage. Bleu D'Auvergne - hard to get hold of, this maincrop potato has a very fine-grained waxy flesh, excellent for purées and soups. It is white-fleshed with a beautiful blueish purple skin. A French heirloom variety. Cherie - a first early oval salad potato with a very pretty, deep rose-pink skin with pale yellow flesh. Very heavy crops too, and a wonderful flavour. Great boiled, steamed or sauteed. Ratte - an early maincrop with waxy yellow flesh - very nutty flavour and perfect as a salad potato but also very good mashed. Similar to Pink Fir Apple, but less knobbly. Roseval - a fabulous second early variety this is fairly rare in the UK but very popular in France. Tubers are smooth, deep red skin and yellow flesh, occasionally with pink flesh. The flesh is waxy with a truly superb buttery flavour. Excellent for salads, hot or cold. Outstanding flavour." There is more information here about all these varieties including illustrations here on a most informative pdf that I've just come across and now wish that I had seen earlier. NB For information about 'Ratte' see 'La Ratte'. I thought that it would be fun to go for a number of different potatoes this year rather than just a couple. I have grown 'Belle de Fontenay' and 'Ratte' before but the other varieties will be a new taste sensation. Although I got mine as a collection all the varieties are available on their own from internet sources, whilst some of them can be bought from your local garden centre. I was also looking out for a couple of other varieties locally last week, but was dismayed to see long spindly shoots already protruding from the ones I fancied. Do you have a favourite spud? The search continues for an outlet that stores its seed potatoes at a reasonable temperature. Two thoughts have dawned on me whilst writing this post. The first is that I must make it a priority to get to my allotment plot this week waders and snorkel at the ready. The second is that it looks as if we will be eating lot of salads this summer so what else am I going to grow to go with them?